This image separates out the Hubble eXtreme Deep Field by the distances of objects within it. The galaxies in the XDF are not close together — they lie along one long line of sight from Earth to the very edges of the visible Universe. The most distant objects within the XDF are more than 95% of the way back to the Big Bang, while a few stars in it are within the Milky Way. In the left pane are objects whose light has taken less than 5 billion years to reach us. In the centre pane are objects whose light has taken 5 to 9 billion years to reach us. 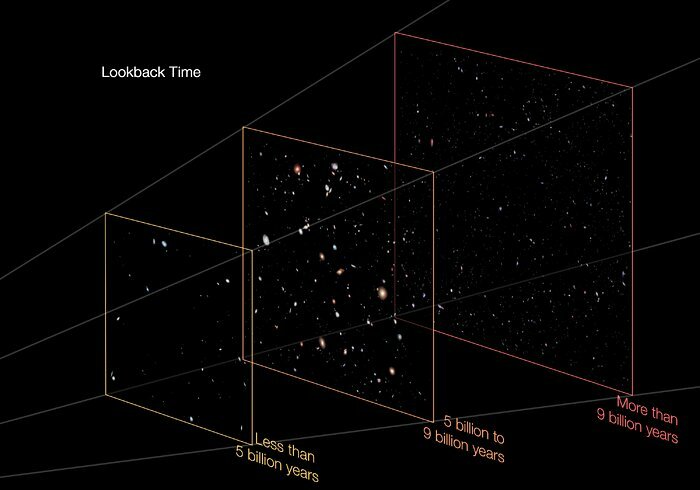 In the right pane are objects whose light has taken more than 9 billion years to reach us.